Earlier today we told you that the second-generation Motorola Moto 360, and the Motorola Moto X Pure Edition were available to be pre-ordered from the Moto Maker website. Now, we can tell you that the second-generation Moto 360 and the Huawei Watch can both be pre-ordered from the Google Store. Both Android Wear powered smartwatches were unveiled earlier today. The second-generation Moto 360 is available for pre-orders from Google's online store in Black (42mm) or in Cognac (46mm) priced at $299.99 and $349.99, respectively. Shipping is free. The timepieces will ship from the warehouse in three to four weeks. The second-gen Moto 360 has a stainless-steel build, and a display protected by Gorilla Glass 3. With over 24-hours of battery life available, the Moto 360 is ready to be used throughout the entire day. And the charging dock helps turn the timepiece into a bedside clock during the evening. With Wi-Fi connectivity, you can still use the apps on your watch, even if you forget to bring your phone. And the second-generation Moto 360 will track your heart beat, the number of steps you take and the amount of calories your burn. 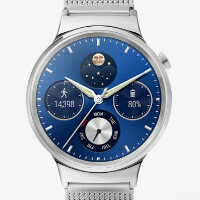 The Huawei Watch features a stainless-steel build and its sapphire crystal display protects the watch face from scratches. With 40 watch faces pre-installed and 1500 downloadable choices, it's like walking around with a new watch on your wrist day-after-day. The timepiece will track all of your exercises including walking, running and even stair climbing. Google Store has the timepiece available for pre-orders in silver, priced at $399. This model will be shipping from the warehouse in two to three weeks. The Google Store is offering free shipping for both devices. Whether it is the second-generation Moto 360, or the Huawei Watch that you want to wear on your wrist, you can reserve your own watch right now by clicking on the appropriate sourcelink. Google needs to hurry up and add more features to the Android wear app on iOS. These watches are beautiful. I would buy one in age art beat over the horrible Apple watch. I'm looking to buy a watch for my new iPhone 6s. The Moto 360 in black looks soooo good. You can already use you voice on the Moto 360 to set alarms, agendas, reminders, do searches while its attached to an iOS device. You currently cannot install apps on any Android Wear device for iOS. I just preordered the Huawei but I might cancel. Lol For sure I want the Gear S2 Classic though. "And the second-generation Moto 360 will track your heart beat, the number of steps you take and the amount of calories your burn." So you are saying it works exactly the same as the 1st generation Moto 360?